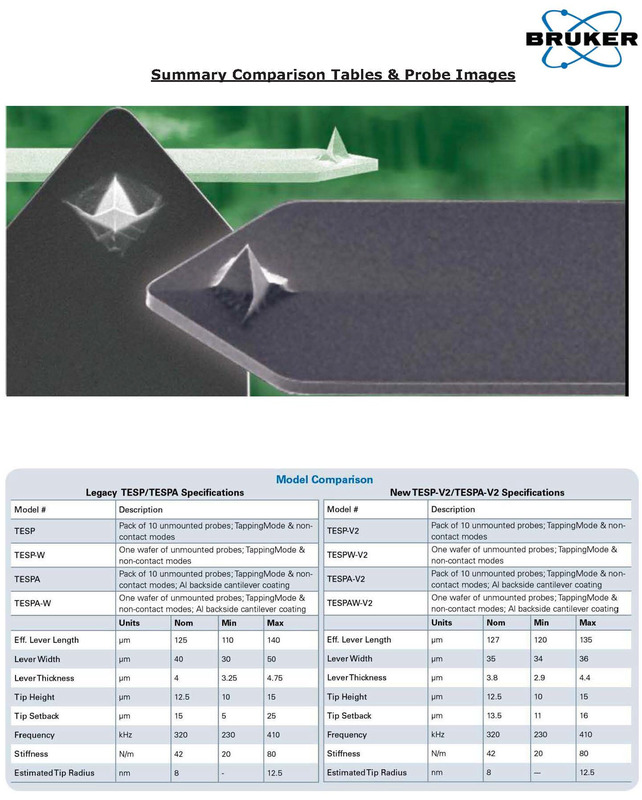 Bruker is pleased to announce the introduction of our new range of Silicon TESP/TESPA probes. Models TESP & TESPA will be replaced by TESP-V2 TESPW-V2 & TESPA-V2, TESPAW-V2. The probes are very similar in design with improvements in quality and tightening of dimensional variation. A summary comparison chart is attached for your reference. Full specification details can be found on www.brukerAFMprobes.com. Bruker is providing advanced notice to you to ensure a sufficient time for transition to these new probes. It is anticipated that sales of the current probe models will be available until the end of March 2014. When you come to re-order TESP/A probes, please order the new probes. Bruker appreciates your business and continuing confidence in our products and technology. We will continue to support your investment in Bruker AFM’s in the years to come. Please consult your local Bruker representative for any questions regarding this policy or email us at probesinfo@bruker-nano.com or at one of the regional contact emails below. Lastly please take time to visit our website, www.brukerAFMprobes.com for the latest information, promotions and announcement concerning AFM probes. AFM Business Unit, Bruker Nano, Inc.